Hi all. I have seen this issue has been discussed before but thought I would start a new thread as I try to recall the various ecclesiastical tiles and followers. My initial confusion concerned Monasteries and Cloisters - how were they different? Then I realised that (most of the time) they were synonymous. I try to avoid using the term cloister now. Monastery, also known as a Cloister in some rules. The terms are synonymous in this instance. A tile based in a field and connected may be connected by a road(s). A follower placed on a German/Dutch/Belgian Monastery is called a Monk or an Abbot (1). 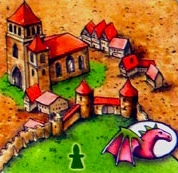 A Phantom, Wagon, or flyer can occupy part of the tile BUT in all except the Flier, the tile can only be used for one function – (a) Monk/Abbot(1); Thief; Farmer. The Flyer deployment has rules concerning when a follower can be deployed as a Monk or an Abbot (1). I think, someone was still going to add something like this to the WikiCarpedia (Or I heard something about adding it, dunno). Re: the bold part, monasteries/cloisters can also be in cities, e.g. this tile from Princess and Dragon. Ah, thanks. That is one extension I have not got so very helpful. * You can use them to remove a knight from a besieged city. * You cannot place a meeple on a cathedral. It is treated as part of the city as Sinscerly commented above. We really need to add this to a disambiguation page on Wikicarpedia ! Thanks ! I have updated the sheet and will await any further comments before re-posting. A couple of observations and clarifications. 1. Nicholas Mystikos - thank you. I assume with a Monastery in Princess and the Dragon it behaves as any other monastery? 2. Meepledrone - again, thank you. Same question as above for Japanese Buildings and Darmstadt Churches? I have clarified the Mayor point. I have tried to avoid at this stage how each feature scores and special features as I was trying to get to grips with the different terminology of ecclesiastical related tiles and followers. Do you think it helpful if I added, or should this stand alone? I have added that Gardens cannot benefit from Vineyards or Little Buildings as that clarifies a relationship. On a meeple on a Cathedral - I think I understand - a meeple can be placed on a Cathedral but only in its function as a city tile, so is called a Knight. It has no specific tile-related or other followers that can be deployed. 3. Sinscerely - thanks. I have clarified the point you identify. 2. Meepledrone - again, thank you. Same question as above for Japanese Buildings and Darmstadt Churches? Japanese Buildings is a mini expansion with the same rules as German Monasteries. It is considered a New Edition expansion, and the 6 land tiles are aimed at replacing the 6 original monasteries in the base game adding the abbot (1) behaviour. So they are monasteries with an optional extra scoring mechanics. Darmstadt churches behave like regular monasteries but giving 3 bonus points to player with meeple majority on the church tile and the 8 tiles around it (the number of adjacent tiles may differ if playing with German Castles and/or Halflings). So in both cases the answer is YES, they behave like monasteries, although both features provide additional mechanics. The Fairy - can I move it when I have no followers left to place? Rampage 2013 board game with similar followers!